There is more to dog ownership than just bringing home a dog from the Humane Society. "I have installed similar fences, but this is the best kit of this style that I have seen. 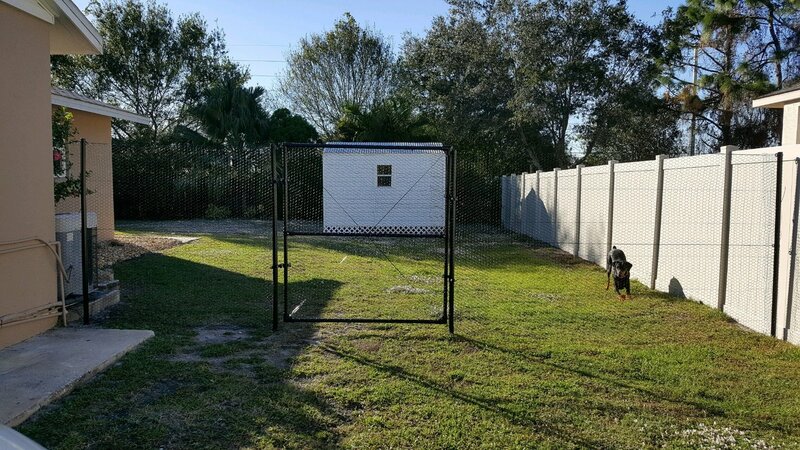 I have a Doberman and this fence gives me the peace of mind that I need!" Timothy R.
Wild animals, even domestic cats, may try to harm the pet; but with a Deerbusters puppy fence, pet owners can find peace of mind knowing their domestic pets are safe behind a reliable pet fence. Fencing for puppies keeps them safe and secure in the backyard while in the training phase. Choosing the right dog enclosure is important to improve animal health and wellness. Chain Link Fences will corrode over time and may hurt dog teeth. In-ground wireless dog fences and shock collars are the most inhumane options since they hurt the dog physically and psychologically. This is why a humane dog fence - made out of plastic or PVC-coated metal - is best to protect dogs while playing outside. Dog fence kits for sale on Deerbusters.com come with all fence materials needed to install an outdoor dog fence enclosure in the backyard. A dog fence kit is ideal for anyone who want to begin a DIY fence project, especially new pet owners. Simply choose the type of fencing you want for your dog to get started. For pet owners with small, calm dogs that will not jump on the fence, Deerbusters.com suggests a poly dog fence kit. For dogs that may challenge the strength of the fence, or for pups who like to dig and chew, consider a steel hex web dog fence kit. Deerbusters fencing for dogs provide your pup with years of entertainment, socialization with dogs and exercise!